Email newsletters are back in a big way. Starting your own is a great way to build an audience for yourself or a company and offers a way to personally reach people in a place that they’re most likely to read: their Inbox. This post will take a look at how to start your own email newsletter, from my experiences running my own technology newsletter over the last year. From the best tools for sending your emails to how to find people who might be interested in subscribing. What should my newsletter be about? One of the age-old questions when starting anything new: but what should it be about? If you’re considering starting a newsletter, you probably have an inkling of what you’d like to talk about. When I started my personal newsletter, I wanted to get technology news in the hands of everyone, since most people often can’t keep up with what’s going on. What’s best is you pick something that you feel you can offer a unique perspective on; people are hesitant to let just anything into their email inbox so you need to show value from the start. The best newsletter fits into a fairly narrow niche where you can deliver useful info. For example, former TNW Asia Editor Jon Russell, runs an excellent weekly newsletter that looks at tech in Asia, while Benedict Evans of investment firm Andressen Horowitz has a great newsletter that focuses on mobile. One place to get inspiration is a quick search for ‘newsletter’ on Product Hunt, which gives you a good idea of what topics are popular and where some potential gaps might be. The no-frills place to go if you want to get your newsletter off the ground with minimal effort. Tinyletter is perfect for just writing whatever you like and hitting send to a group of people. 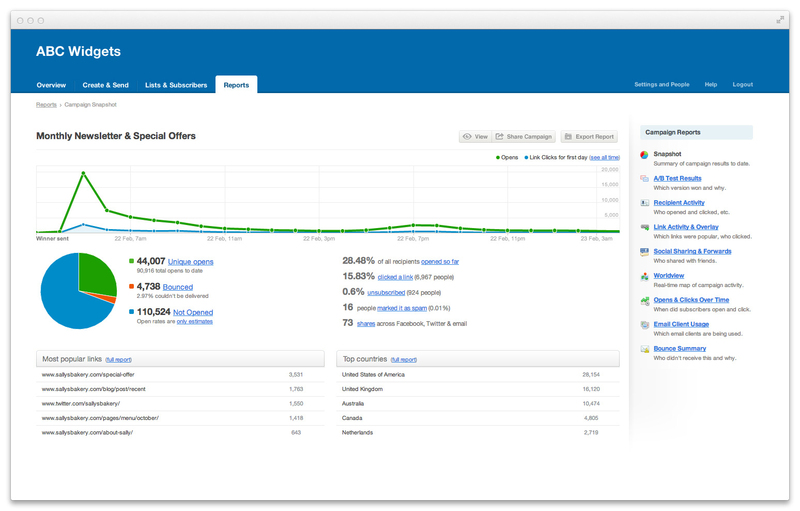 It offers the things you need, like subscription landing pages and subscriber tracking, but not much more. Tinyletter is a great place to start when you’re unsure about your newsletter or when you just want to write and see what happens. Since it’s free, there’s no risk in just trying it and seeing what happens. This is my favorite way to send a random, off-the-cuff email newsletter out to people to just test how it’ll go. If you’re a little more serious about your new email newsletter, or want to have total control over the experience, Mailchimp could be the option for you. With Mailchimp, it’s free for up to 2,000 subscribers and you have control over how everything from the landing page to the email newsletter itself looks. Those with developer inclinations can build their entire email newsletter template if they choose, otherwise Mailchimp has a drag-and-drop editor along with built-in themes for those that don’t want to deal with coding to get the look they want for their own newsletter. Mailchimp offers some smarter ways to send the email itself, too, like automatic delivery based on subscriber timezones. You’re also able to set up the service to ask subscribers for other information, like location, gender or anything you please. One of the benefits of Mailchimp’s paid plans is you can automatically test how your email will appear in almost every email client that matters. You hit test and the service shows you pictures of how it’ll look in each email client. When I was starting out, I used Mailchimp because it was free and offered the control over the style of the resulting email that I wanted. After 2,000 subscribers are onboard it gets a little pricy, but at that point you’re probably serious enough to pony up some cash. 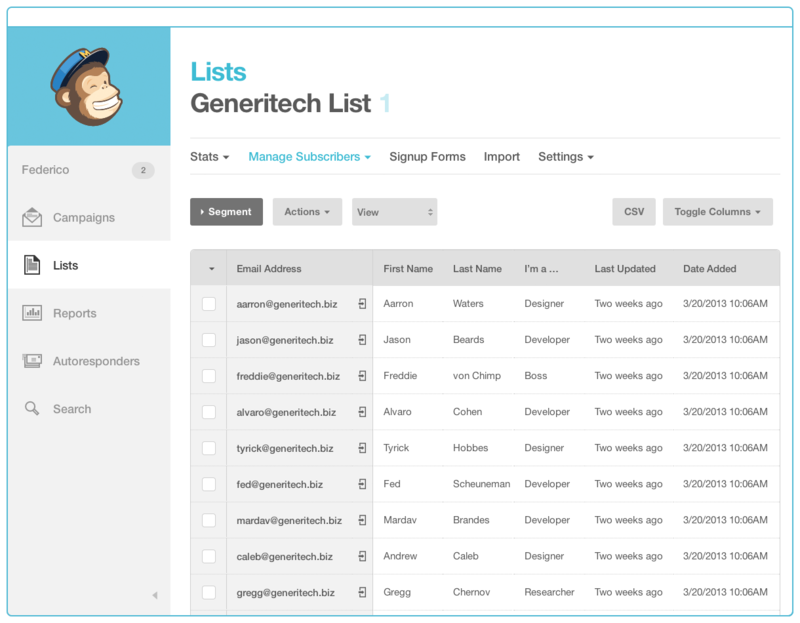 In the same vein as Mailchimp, Campaign Monitor gives you control over your emails and landing pages. It features an easy to use drag-and-drop email interface and templates to get you started. For developers, Campaign Monitor offers lots of awesome features and doesn’t force branding on you along with helping to make it easy to design for mobile phones and more. My favorite feature is Campaign Monitor’s analytics, which are incredibly in-depth and offer the ability to watch real-time email open tracking visualized on a map. Just like Mailchimp, you can test your email’s appearance easily and if it’ll make it through spam filters in a cinch. The difference with Campaign Monitor is that there’s no free plan. It starts at $9 per month to send up to 500 subscribers, but if you’re serious about getting into email newsletters, you won’t be put off by that. This newsletter platform is relatively new, but offers a unique angle on managing the process of building a weekly newsletter that’s made up of a bunch of links. As you find articles you like, you can add them as items in Curated for a future edition, then quickly add each one with a blurb to your newsletter. 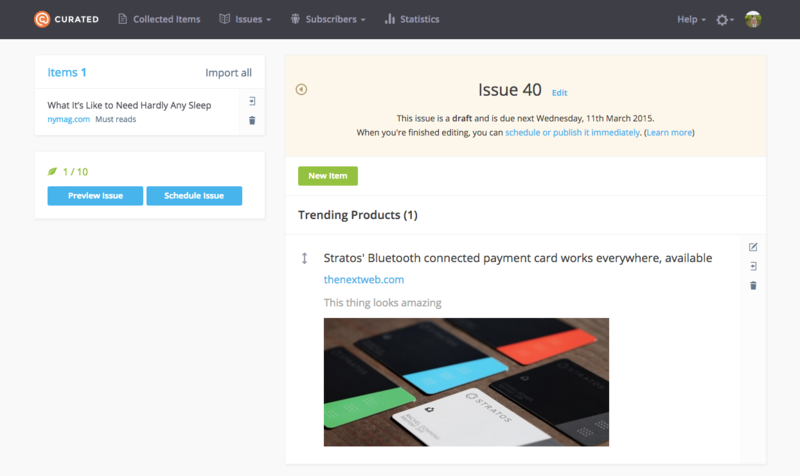 The idea behind Curated is that it removes all the work of actually designing and laying out the newsletter. There are few options when it comes to the look and feel of the design, outside of colors, icons and titles, but it also saves you a significant amount of time by gathering them all in one place for you. Right now, I use Curated for my personal technology newsletter as it makes it easier to keep track of good articles and quickly build the newsletter without any hassle of laying out the content itself. The service also offers a sponsorship platform so you can consider monetization by taking on sponsored links later on. Built by Dave Verwer, who is behind the popular iOS Dev Weekly newsletter, Curated is the best option for consistent emails where you’re curating a bunch of links, that don’t take an age to put together. Curated starts at $25 per month to use the platform. The first few times you sit down to actually write your newsletter, you’ll probably sit at the computer staring aimlessly at an empty text box with no idea what to write. This is normal. Just keep on trying to type in that intimidating white box and eventually the flow will start. Make sure to set the same time to write it every week if you can. Designate newsletter writing time, where you won’t do anything else, but write. Finding your ‘voice’ sounds cliched, but it can be hard to get right at first; most people’s default setting is to put on a sort of third-person voice like you’re writing a corporate blog, but it’s important to remember that email is inherently personal. You probably want to talk like you’re talking to a real person, not just a faceless inbox. It makes it far easier if you gradually collect the content of that week’s newsletter somewhere during the week. I used Evernote and Pocket to quickly make notes or drop an interesting link for storing later. It’s surprisingly easy to completely forget an interesting thing’s existence if you don’t write it down immediately. Here’s the thing; lots of people have gone before you and sent out a bunch of interesting links they found. That’s cool if you want to do that too, but just remember that there are plenty of other interesting places to get those things. If you want to provide something of use to people, like I’ve alluded to, you need to add an angle or insight that’s not available anywhere else. Instead of just dumping in a link with a description of the content, add why you think it’s interesting, a bit of background or just a stupid joke about why it’s dumb. Anything other than just regurgitating stuff from elsewhere is good. Setting up the software and coming up with an idea is pretty easy, but how do you find people that might be interested in what you’re doing? There’s a few different ways, depending on the topic of your newsletter, but the first place you should start is your landing page. You should have a landing page for your newsletter that describes what’s in it, how often it’ll be sent out and what value the potential subscriber will get out of it. That landing page is going to be the first and only impression you get to make on someone to get a spot in their inbox, so it’s worth spending a decent chunk of time getting it right. Even better, if you can surface the content of your newsletter without just showing an archive page, people can get an idea of exactly what it’ll look like. Word of mouth is powerful and can get you a long way. Tweet about it, tell people you know and ask in your newsletter if those subscribed can share it on. This is always the best place to start. Next, once you find your feet and have sent a few out, start telling established communities about your newsletter. I started by sharing mine on Product Hunt, then Reddit and other websites that feature newsletters specifically. Seek out communities related to your topic and tell them about it; don’t spam them endlessly, but just drop it in where you can. This technique generates a decent amount of interest and buzz, but is only temporary. I’ve also experimented with everything from Facebook to Twitter ads, which worked fairly well but are not a cost-effective way to reach people by any measure. One thing I’ve had good success with is Twitter’s lead-generation cards that allow people to subscribe with a single click and stand out in the feed; they’re worth experimenting with as they can capture people’s email address with ease. Mailchimp has a great guide on how to set these up. 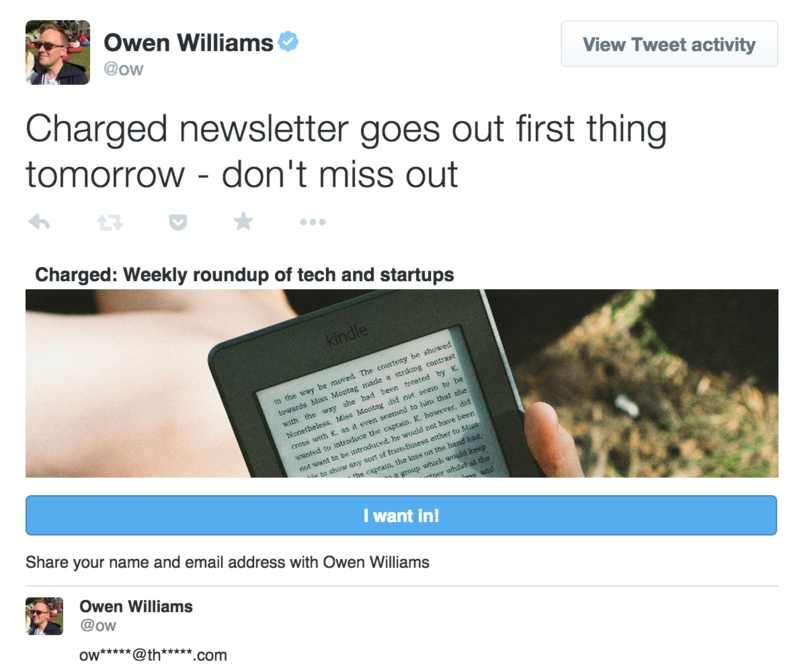 Asking people to share your newsletter (or providing a tiny tweet link) actually helps quite a bit, just be sure to avoid overdoing it. There are four important metrics you need to know about when it comes to figuring out how well your newsletter is doing. Kind of an obvious one; this is how many people actually signed up and receive your newsletter. A good one to keep an eye on. The percentage of people from your subscriber base that actually open your newsletter. There’s varying opinions on what kind of open rate is good, but my opinion is you should be shooting for at least a consistent 50 percent, otherwise your list is dying or may be getting stale. The percentage of people who click a link in your email newsletter. This only begins mattering if you start talking to sponsors for your newsletter, but gives you a good idea of if people are actually clicking on what you send out. Apparently the industry average for this is something like 2 percent. Don’t get yourself too down about this, but do keep an eye on it. Most email sending systems offer unsubscribers a box to share why they’re unsubscribing, which is a good insight into what you’re doing right or wrong. It can hurt the first few times someone unsubscribes and feels personal, but remember that it’s not and that in that person’s shoes they might not have enough time to read your email. Here’s a warning for you: it’ll often feel like nobody cares or you have no idea if it’s effective or not. That’s the nature of email! There are no comments or ways to gauge just how it’s going outside of those cold numbers we talked about above, but there is a solid way to get people’s insight: just ask for replies. Most of the time, people will just read your email and move on, but if you make it clear that people can simply reply to your newsletter to reach you, often you’ll receive useful feedback from readers. 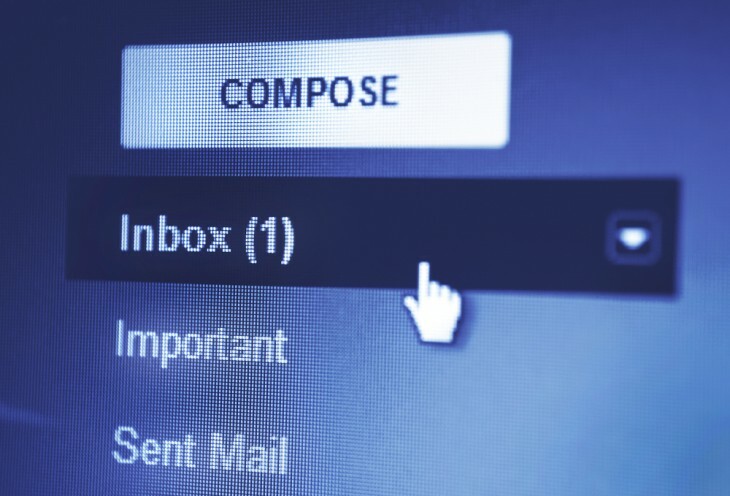 Have you ever run an email newsletter successfully? Or one that totally didn’t work? We’d love to hear from you in the comments about your experiences.